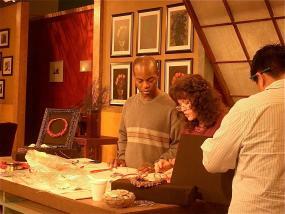 DIY Jewelry Show: This is a photo of me on the DIY Jewelry Show on the Discovery Channel demonstrating how to make the Red Coral Necklace. If you look to the left, you'll see the necklace displayed. You'll find the tutorial for this necklace in "Necklaces" by clicking "Tutorials" next to "Home". Ornament Magazine, Thirty Fifth Anniversary Edition, Volume 32 No. 5: Page 74. Article: "Little and Large" showcases my woven bracelet with amethyst briolettes and "Odyssey" woven wire sculpture along with four other artists. The "Little and Large" exhibit showcased 100 artists in 41 galleries throughout San Diego county in support of the Calder Jewelry Exhibit at the San Diego Museum of Art. Sculptors and art jewelers were challenged to produce both a piece of art jewelry and a sculpture in honor of Calder. Ezine Articles: Expert author 2010. You can go here to read the articles I've written about wire jewelry making. MY JEWELRY EXHIBIT SITE: WOVEN WIRE STUDIO is the home of my gallery/exhibit jewelry and my reference website. You can just CLICK HERE to visit there.